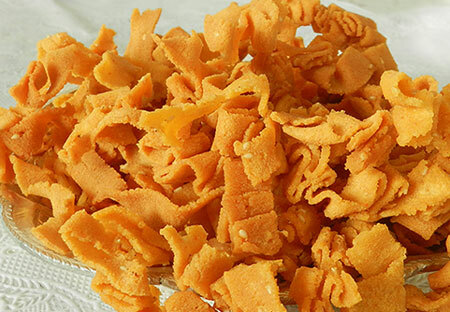 Ribbon pakoda or Ribbon Crisps is a famous recipe of Tamil Nadu. Ribbon pakoda is very easy and anytime snack which is usually made during Diwali festival. Since the ribbons can resemble a tape, it is also called tape pakoda. In this recipe, instead of adding red chili powder to the dough, you can also add 2 teaspoon ground green chilies. You will get lighter colored ribbon pakoda. 1. Combine all the Ingredients except oil for frying in a large bowl. Mix thoroughly with your fingers till butter is well incorporated and it resembles breadcrumbs. 2. Gradually add 3/4 – 1 cup water to it and knead to make firm dough. 3. Now, heat oil in a deep frying pan till smoking. 4. Now, Add 1 tablespoon hot oil to dough and knead again, insert the ribbon pakoda disc (with two ? inch slits running along its diameter) in a thenkuzhal press. 5. Fill the container with dough and press dough out in ribbons into a hot oil. With a slotted spoon break ribbons into convenient length to facilitate even cooking. 6. Turn ribbons and fry till the hissing sound ceases and they are becomes golden and crisp. 7. Now, remove with a slotted spoon and place on kitchen paper to absorb excess oil. 8. Let it cool and store and airtight jars. They remain crisp for a couple of weeks.